In this part, you can setup general option of archive page template. Turn on this option to show sidebar. Choose sidebar for archive page. If you need another sidebar, you can create from WordPress Admin → Appearance → Widgets. Please note, this option will appear and work if Show Sidebar option enabled. Choose content layout for archive page. Set word length of excerpt post content on archive page. Choose date format post on archive page. Set date format for archive post content. For more detail about date format, please refer to Developer Codec. Please note, this option will appear and work if you choose Custom Format on Choose Date Format for Content option above. Choose pagination mode on archive page. Choose pagination align on archive page. Turn on this option to show navigation text on archive page. Turn on this option to show page info on archive page. In this part, you can setup general option of search result page template. Turn this option to force search on post only. By default, WordPress search will also look for single page. Choose sidebar for search result page. If you need another sidebar, you can create from WordPress Admin → Appearance → Widgets. Choose content layout for search result page. Set word length of excerpt post content on search result page. Choose date format post on search result page. Set date format for search result content. For more detail about date format, please refer to Developer Codec. Choose pagination mode on search result page. Choose pagination align on search result page. Turn on this option to show navigation text on search result page. Turn on this option to show page info on search result page. In this part, you can setup general option of author page template. Choose sidebar for author page. If you need another sidebar, you can create from WordPress Admin → Appearance → Widgets. Choose content layout for author page. Set word length of excerpt post content on author page. Choose date format post on author page. Set date format for author post content. For more detail about date format, please refer to Developer Codec. Choose pagination mode on author page. Choose pagination align on author page. Turn on this option to show navigation text on author page. Turn on this option to show page info on author page. In this part, you can setup general option of attachment page template. Choose sidebar for attachment page. If you need another sidebar, you can create from WordPress Admin → Appearance → Widgets. 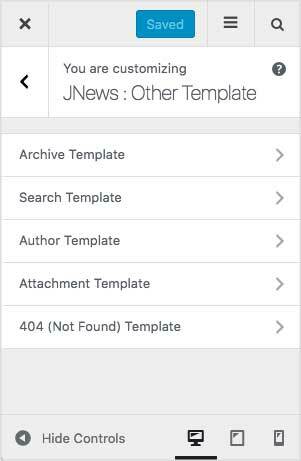 In this part, you can setup general option of 404 (not found) page template. Choose sidebar for 404 page. If you need another sidebar, you can create from WordPress Admin → Appearance → Widgets. Choose content layout for not found page. Set word length of excerpt post content on not found page. Choose date format post on not found page. Set date format for not found page. For more detail about date format, please refer to Developer Codec. In this part, you can setup general option of WooCommerce archive and single page template. Please note, this option below will appear and work if you’re using WooCommerce plugin. Turn on this option to show sidebar on WooCommerce archive. Choose sidebar for WooCommerce archive page. If you need another sidebar, you can create from WordPress Admin → Appearance → Widgets. Turn on this option to show sidebar on WooCommerce single. Choose sidebar for WooCommerce single page. If you need another sidebar, you can create from WordPress Admin → Appearance → Widgets. In this part, you can setup general option of BBPress page template. Please note, this option below will appear and work if you’re using BBPress plugin. Turn on this option to show sidebar on BBPress page. Choose sidebar for BBPress page. If you need another sidebar, you can create from WordPress Admin → Appearance → Widgets.